The accessibility block allows the user to change the look and feel of the course page to increase and decrease font sizes, have text read aloud, use coloured overlays, readability and a dictionary to aid reading. Spell check and try word prediction when writing. It is designed for those who may not have their assistive technologies to hand and need a quick way of accessing text on the screen with magnification and/or text to speech etc. It can help those with low vision, dyslexia, other reading difficulties as well as those who may wish to just reduce the glare of black text on bright white backgrounds. It is not designed for regular screen reader users who need their assistive technology to access the computer as well as their browser. At SOAS we have added the accessibility block to appear on the right hand side of all our Moodle courses to improve accessibility. Allows users to report accessibility issues with a website. Volunteers then take these issues forward with website owners to encourage improvements. Allows users to change the font and line spacing changes of the text. Whilst writing in a plain text form suggestions are shown to the user below the text-area after a pause. Please note that this may not work with rich-text editors that already have spell checkers. Users can highlight a word in the web page and a definition from Wiktionary will appear. A user can have a highlighted text read aloud. Please note that large pages may require a user to select smaller portions of text at a time. Is a service that converts the page into text only to reduce the 'clutter' to make it easier for the user to read the content. Works with most plain text edit forms. Simply select the menu button and begin typing, then allow a second for the word list to appear after the first few letters. It allows users to finish the word or choose another. It can help with spelling, word finding and may even speed typing. Allows the user to change look and feel of the ATbar toolbar, change the web page colours – background, text and links or choose pre-made page styles. Provides a colour tint over the entire webpage. You will see a choice of colours – cream, pink, pale blue and pale green. These buttons toggle the colour overlay on and off. Restores the webpage back to its original style. When you insert your data into the Google spreadsheet make sure you not to remove any columns or column headers or to leave any blank rows. In addition to the timelines below some of our course leaders have been exploring the use of timeline for their courses whereby each week would have a reading or link in the timeline for the student to read prior to coming to the lecture. Padlet is a web application that consists of a web page “wall” where content can be posted, viewed and commented on by multiple people. 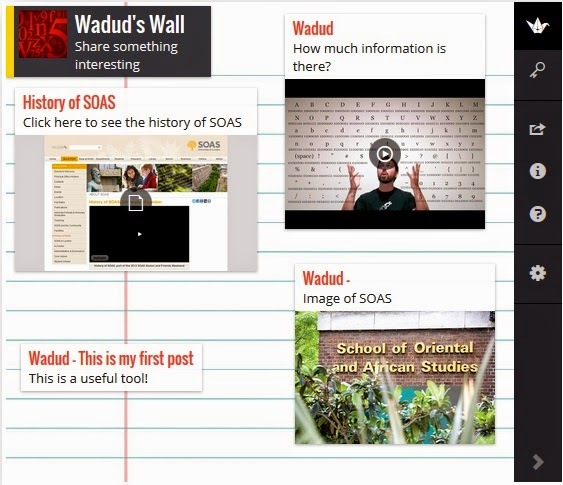 The function of your wall depends entirely on what you create; you can make a wall where students come to view content uploaded and managed by an instructor, or create a wall that is used as an open forum where anyone can post and discuss content. Padlet is incredibly easy to use and a great way to share and manage content with others in an intuitive and fun way. Visit http://padlet.com/gallery to see other example of Padlet walls.